David Shackleton was born in Leeds, UK on 2 March 1948, and joined the RAN in 1966. He served almost continuously at sea from 1967 to 1979 in a range of HMA Ships, as well as undergoing training in the United States and on exchange service with the Royal Navy. He saw service in Vietnam on board HMAS Perth while qualifying as a seaman officer, and subsequently qualified as a warfare officer, specialising in combat systems and aircraft direction. While in command of HMAS Brisbane in 1992 he led a major RAN Task Group deployment to Southeast Asia. His shore and staff postings have included being a member of the Directing Staff of the RAN Staff College, Project Director for acquisition of the Maritime Intelligence Centre, Director of Operational Requirements for the JORN radar system, and the inaugural Chief Staff Officer C3I to the Maritime Commander. In 1993 he was appointed Director General, Naval Policy and Warfare, responsible for development and coordination of strategic policy for the RAN. Commodore Shackleton joined the Defence Acquisition Organisation in September 1996 as Director General, Information Management. Following the Defence Reform Program, in July 1997, he become the first Director General, Command and Support Systems, responsible for development and acquisition of all of Defence's major command and intelligence information support systems and major operational headquarters. On promotion to Rear Admiral in July 1998, he took up the position of Head, Capability Development, with responsibilities for sponsoring all new major capital equipment requirements initiatives for the Australian Defence Force. He was promoted Vice Admiral and appointed Chief of Navy in July 1999. 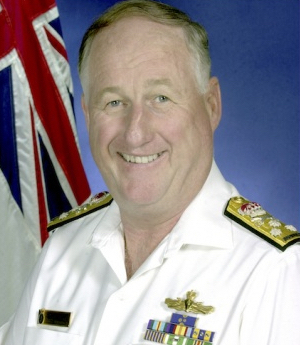 Vice Admiral David Shackleton retired from the Royal Australian Navy on 2 July 2002.